In the context of the Active Recreation and Sport Strategy, active recreation and sport involves a spectrum of opportunities that include active play, active living, competitive sport, and physical activity pursuits that benefit all Edmontonians at all stages of life. Includes all physical activities that an individual chooses to do for fun, health, social interaction, and relaxation (adapted from National Recreation Statement and the Canadian Sport Policy 2012). Includes physical activities that are less structured, providing enhanced opportunities to explore, discover, and interact with the physical and social world. Includes physical activities that become integrated into an individual's daily life style (adapted from Active Alberta 2011-2021). Includes modes of travel that require physical activity, such as walking or cycling, in contrast to other modes that require little physical effort (adapted from Active Alberta 2011-2021). Includes organized physical activities that result in a contest between 2 or more people participating individually or as a team, through observation of rules, regulations, and potential officiating. Includes physical activities pursued by highly trained individuals competing at the highest levels at regional, national, international and world-class competitions. Supporting excellence requires highly specialized facilities, amenities, services and resources. Includes physical activities involving professionals performing highly specialized talents for financial reward or entertainment. "Let's get moving is the key to creating a Canada that is happier and healthier." 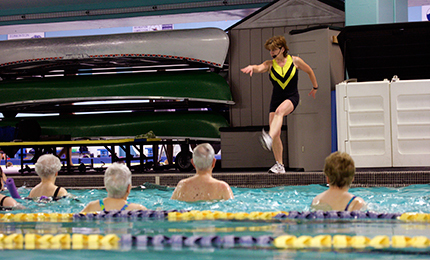 Health Canada encourages Canadians to integrate physical activity into their every day life. A first of its kind partnership that asks Canadians to submit ideas on how we can be more active.